Besides the plethora of wonderful services of Sno-Isle Libraries which we have highlighted in the past several weeks, there are still others to talk about in this post. 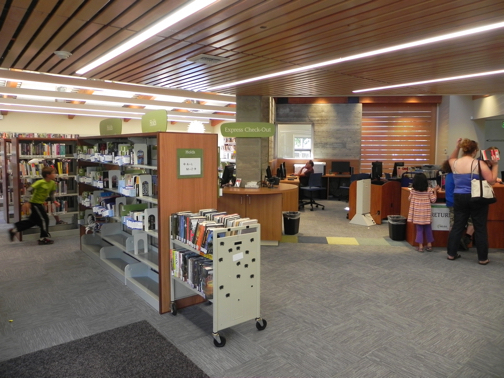 You might want to open another tab so you can refer to the Sno-Isle website as we walk through some lesser known jewels that make Sno-Isle Libraries shine so brightly in our region. Consider what kids can find on the library website. Click the Kids button on the Home page and look at the list of options on the left side of the page. I spent thirty minutes or more just browsing the resources offered to kids and their grownups through Sno-Isle, and I barely scratched the surface. 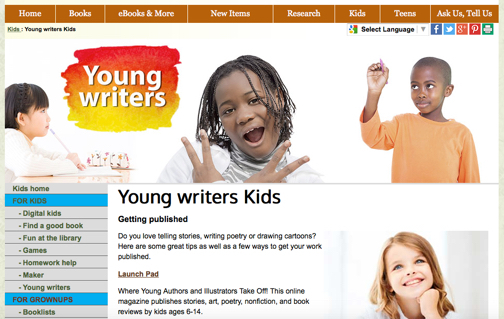 Check it out yourself for links to everything from listening to books read online, booklists, online games, and resources for young writers and creators, to help for parents as they encourage young readers and suggestions fort internet safety. Children and teens alike will benefit from taking advantage of Homework Help, an amazing program that provides many online resources, and also allows kids to post questions 24/7 or talk directly with a tutor between 1:00 and 10:00 pm. 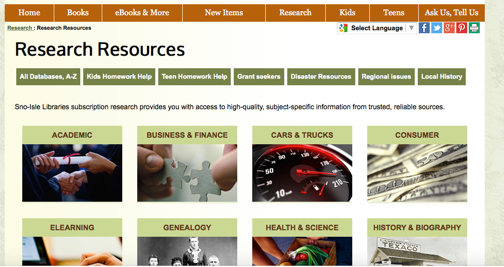 Through Sno-Isle you can get help researching your genealogy, hunting for a job, locating a grant, or preparing for a debate on a political issue. 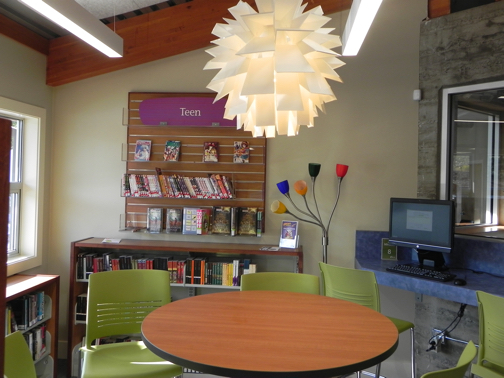 Your club or group can schedule an event in your local library's meeting room. And you can take advantage of one of the many programs hosted by your library. Just one of these programs occurred last winter as Daniel Brown, the author of The Boys in the Boat, visited all five libraries on Whidbey Island, talking about his book and the writing experience. Throughout the year such programs are presented by authors, story tellers, children's entertainers, librarians, and others. 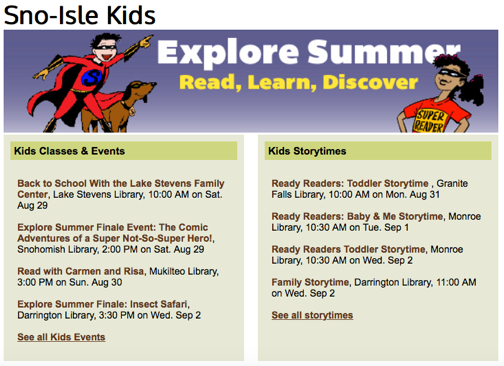 Family Storytime, Toddler Storytime, even Baby and Me Storytime are available in most community libraries. Visits from Reptile Man, opportunities to explore science, and hands-on experiences like Lego Club for kids and Cryptology for teens—exploring and decoding secret messages—are also offered throughout the Sno-Isle system. Click on Classes and Events in the middle of the website's Home page to see what tickles your fancy, then sign up for the fun! 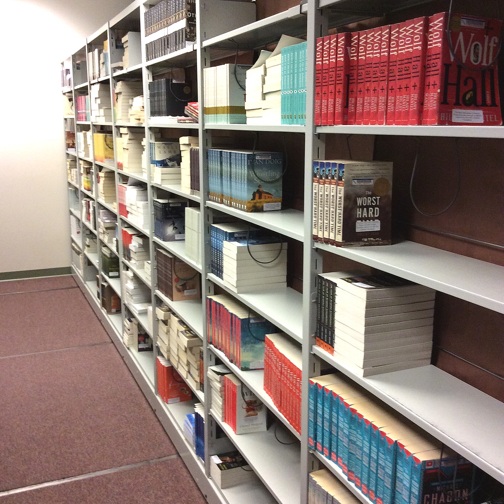 Have you noticed the section of used books and other material for sale in your library? 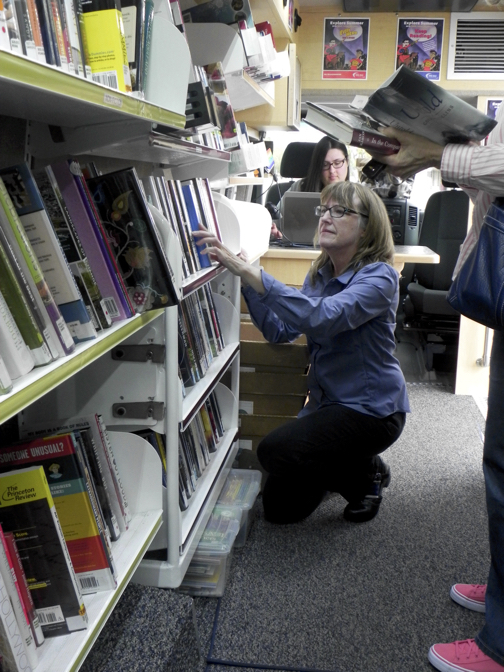 Each community library has a Friends of the Library group whose purpose is to raise funds for their particular library. Each Friends group is a 501c3, with its own governing board, and exists to provide the extras that fall outside the Sno-Isle budget. You wouldn't think that they'd make much money selling items for 50¢ and $1, but in 2014 the Friends groups $250,000 and gave back to Sno-Isle Libraries over $233,000! Over $116,000 of that money went to fund programming: Explore Summer (summer reading program) the Insect Man, the crafts at children's programs, and other programs. 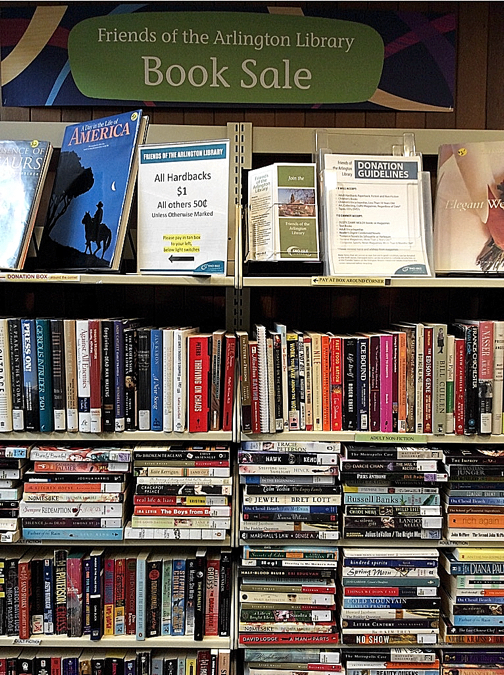 Next time you stop by your community library, don't just walk past the Friends book sale. Even if you only get an item or two, you'll be helping make it possible for another great program to come to town. You might even go a step further—contact your local Friends of the Library and see how you can get involved. They're always looking for new folks to join their groups. It just might be a perfect fit for you! For fifteen years I've had the idea of visiting each of the twenty-one branches of Sno-Isle Libraries. Alas, I still have five to go. Maybe I can finally accomplish my goal before Fall arrives. I know this feat has been accomplished before, and it took only one day. In 2010, fifteen-year-old Maggie West and her dad, Randy, started at the Mukilteo Library and made it to every library in the system, a 307.8-mile trip, squeaking into the Edmonds Library, their last, at 8:56 p.m., just four minutes before closing. You can read about it here, in the Herald, and watch the fun video below. Bonus: There's a great map of Sno-Isle Libraries included with the Herald article. Sno-Isle Libraries is worth exploring, whether you visit all twenty-one or just your local library. But, as LeVar Burton said on every episode of Reading Rainbow, "You don't have to take my word for it." Go hang out at your library or check them out online! 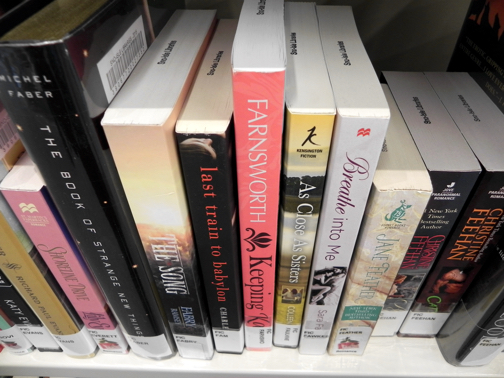 Today's post ends the series on What You Didn't Know About Sno-Isle Libraries So You Didn't Know to Ask! You can read the other five posts here: Part 1, Part 2, Part 3, Part 4, and Part 5. Have you ever been in a book club? If you have, you know how invigorating it can be to read a novel or a classic, even a non-fiction work and gather with friends for a lively discussion about the book. You know that your thinking will be challenged and your communication skills improved as you ponder the book and find ways to express your response to it. You'll come away with new perspective and new friends. 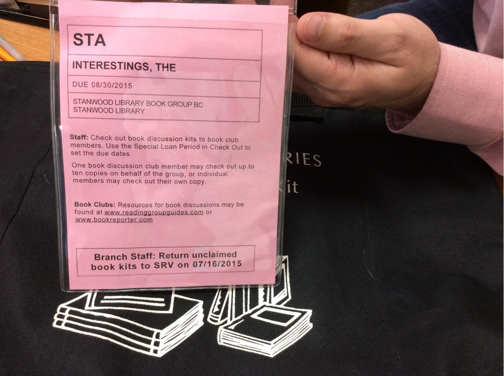 If you have never been in a book club, maybe this post, about Sno-Isle Libraries book discussion kits, will inspire you to find (or create) a group of your own. 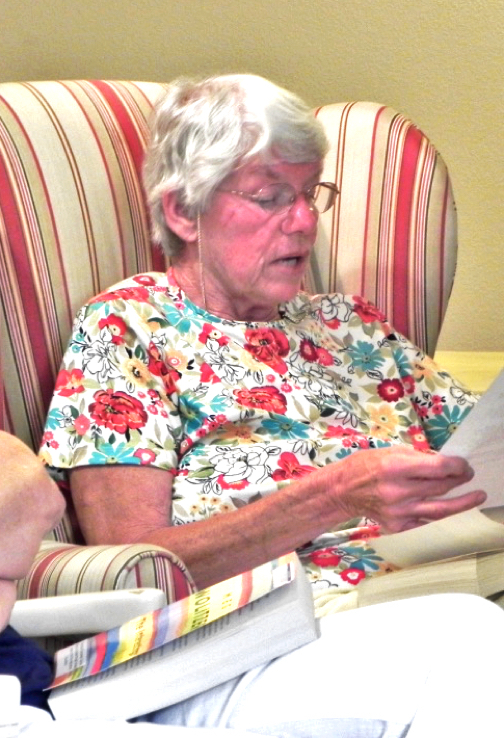 Last week I stopped by Stanwood Library's book discussion group which meets monthly at Brookdale Senior Living. 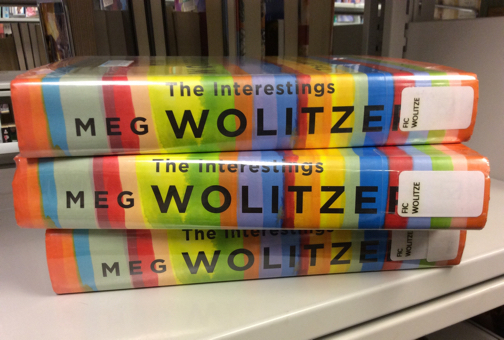 The book they were discussing was Meg Wolitzer's, The Interestings. Over the past several months the group has read and discussed a wide variety of books, including such titles as To Kill a Mockingbird, Sarah's Key, The Girl's Guide to Homelessness, and Orange is the New Black. In the next few months some of the titles they will read and discuss are Man in the Window, Detroit: An American Autopsy, Boys in the Boat, and Stuff. 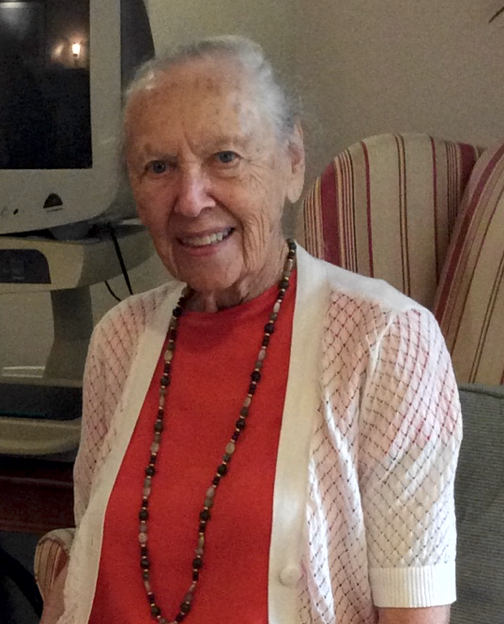 Stanwood's group started about eight years ago and each month nine to twelve people attend. Conversation among the book group was lively and well informed, and it was clear that the readers had interacted with the story. They were animated about The Interestings, which brings together six individuals in the mid-1970s who meet at camp and it follows them into middle-age. 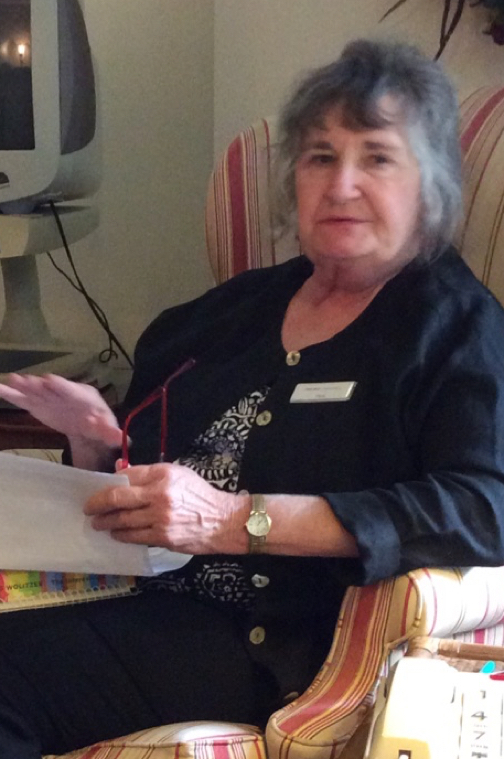 Mary kicked off the discussion by reading a great review she'd written. "I just hung on every word!" she exclaimed. There was concensus among many in the group that The Interestings was a really good character study. "I got into the characters right away," said one. Another proclaimed, "As a character-loving reader, I am in hog heaven!" The book, however, did not appeal to everyone. One participant said, "I like a book that grabs me, and this one just didn't grab me. I have a thing about teenagers who are full of themselves." 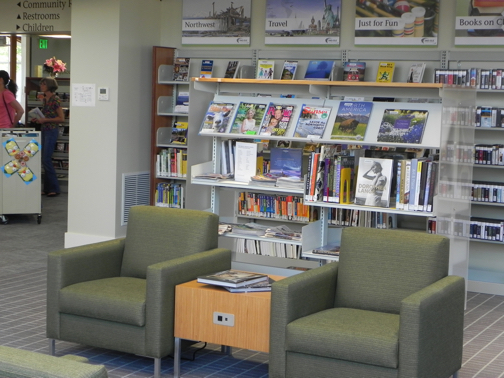 Most of the libraries in the Sno-Isle system host book discussion groups as one of their many services to the community. Whether you are in a library-sponsored book group or meeting with friends in your own book club, Sno-Isle makes available book discussion kits for a sixty-day check-out period. There are currently discussion kits for 223 titles, with ten copies of the book included in each kit. For some titles discussion questions are available, but not for all. 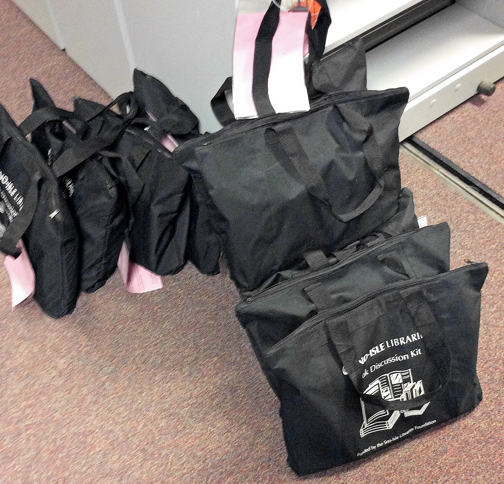 Each month the Service Center delivers between sixty and seventy book discussion kits to libraries throughout the system. 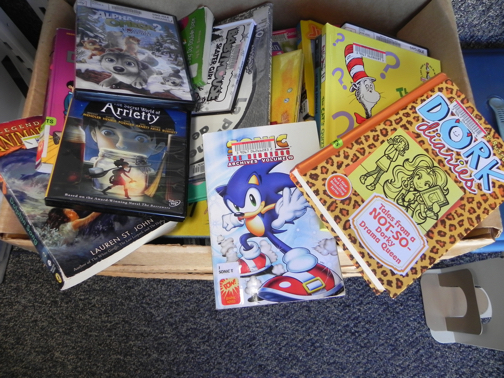 The Sno-Isle Libraries Foundation funds these kits. If you're not already a part of a book group, whether your group originates with Sno-Isle or not, here is a great way to get a group started. Click here to learn more about book discussion groups, then look at the options of titles available and the dates they are available and put a kit on hold. But beware, these kits are so popular that sometimes groups have to wait as long as a year to get the titles they really want. 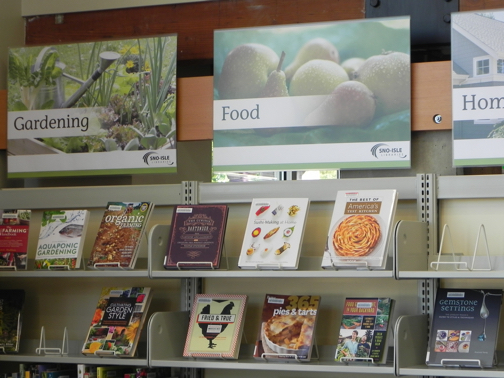 Or contact your local Sno-Isle library to learn when their book discussion group meets. There ought to be room for you to join in the fun! To see earlier posts in this series, click here: Part 1, Part 2, Part 3, and Part 4. Here's a great video that will introduce you to even more benefits of the library! Among my greatest childhood joys was our Bookmobile ritual. We would load up our returning books, walk the two blocks to the fire station where the lumbering Bookmobile would park, and enter an unknown world right in our neighborhood. We'd deposit the books we'd already read and search out new, exciting titles to take home with us, and for the next two weeks we'd immerse ourselves in the people, animals, magic tricks, science facts, adventure, and wonder through the pages of our new library books. 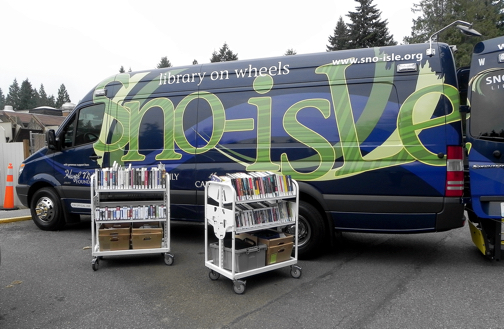 I suspect that is why I was so excited to discover Sno-Isle's Bookmobile and Library on Wheels. I stopped by the Bookmobile while it was parked at Lakewood High School on a recent Wednesday afternoon. 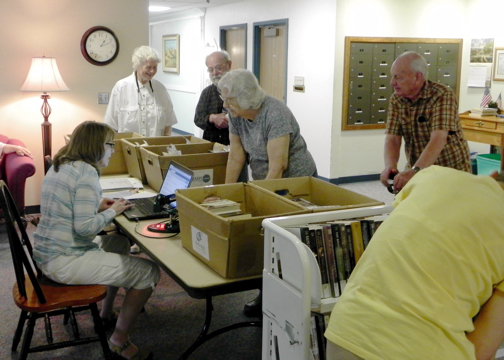 Several folks came to return books and hunt for new ones. Since many of the visitors are regulars the staff knows their taste and can suggestf items they might enjoy. 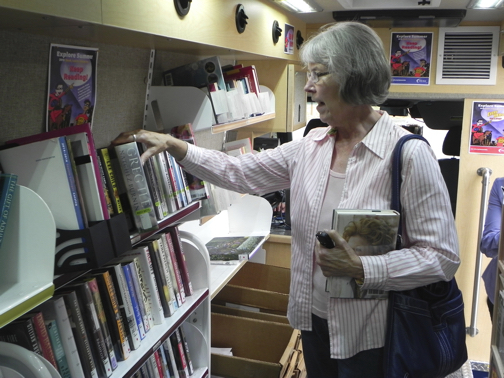 The reading preferences of the regulars also influences what items the staff put onto the Library on Wheels. "Ah, a new title by a favorite author!" 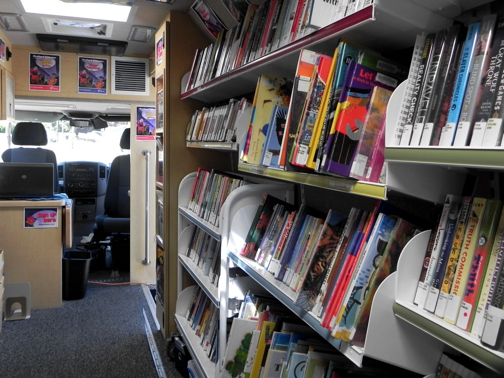 Because the Bookmobile is difficult for some folks to navigate, a second type of Library on Wheels exists. Instead of stationary shelves in the van, all the materials are placed on carts which can be wheeled into nursing homes, care centers, and other types of facilities. Additionally, Sno-Isle delivers boxes of items to folks who are homebound. A similar service exists for preschools. All of these materials are personally selected for the individuals or facilities who receive them. If someone you know lives within the Sno-Isle Library system and cannot get to a library because of age or a long-term disability, you can apply for this service. 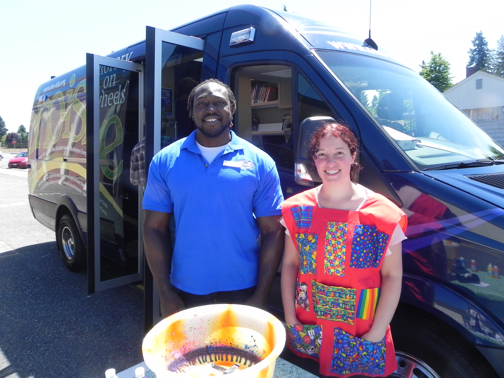 This summer the Bookmobile has made stops twice a month at two elementary schools that serve free lunch to kids in the neighborhood. I visited one of the stops where I met Sno-Isle staff members, Brian and Candyce. 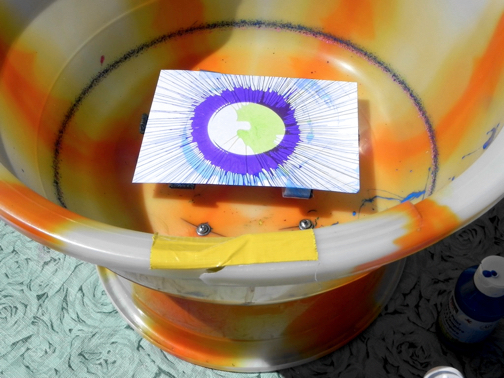 While Brian invited kids in to browse the books or return items they'd picked up on an earlier visit, Candyce hosted a table where the children could create a spin art project. 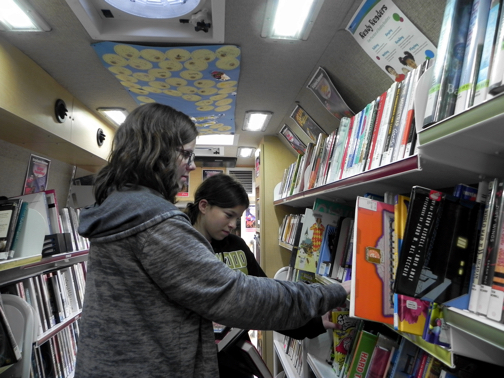 Among the kids who got to use the Bookmobile this summer I suspect that some will grow up to be avid fans of the library. Every outreach staff member that I have met loves what they do. Though they take their job seriously, it is clear that they also find great joy in their work. Traveling to the small, outlying areas they get to know the locals as they become part of the hub of the community. In addition, the job comes with unexpected perks, such as discovering the best hamburger joint or ice cream stand in town! Brian and Candyce, whom I met at the summer lunch stop, told me how they got interested in studying library science. When Brian was sixteen he got a job working as a page in a public library in Florida. Over the years he held different library jobs but never considered a career as a librarian. He wanted to be a doctor. In his thirties, while he was awaiting his entrance exam into medical school, he thought, "I wake up every morning excited to go to work. I love what I do. Why would I want to go to med school when I could be a librarian?" He decided to apply to one school only, the University of Washington's School of Information, and if he didn't get in he would continue with his plan of med school. Not only did he get accepted at UW, he also got a job at Sno-Isle. So he packed up his family and moved to the Northwest from his native Florida. Candyce's story is similar. On track to complete a degree in neuropsychology, she was working at a large bookstore. When her supervisors asked her to take over the children's section as manager she found her niche—kids and books. She, too, left one career track for another. Clearly both these young people love what they do. My final stop on the Library on Wheels routes was to a senior community where the van brings books, DVD, CDs and other material personally chosen for the residents, along with their carts of items that will likely interest the folks. As they entered the building and throughout the moments of set-up, one of the women who had been waiting for them could not contain her excitement. "Do you have my 'happy books'?" she asked several times. I asked what she meant by "happy books." "The news is very negative and after I watch the news I can't get to sleep. So I read 'happy books' before I go to bed." 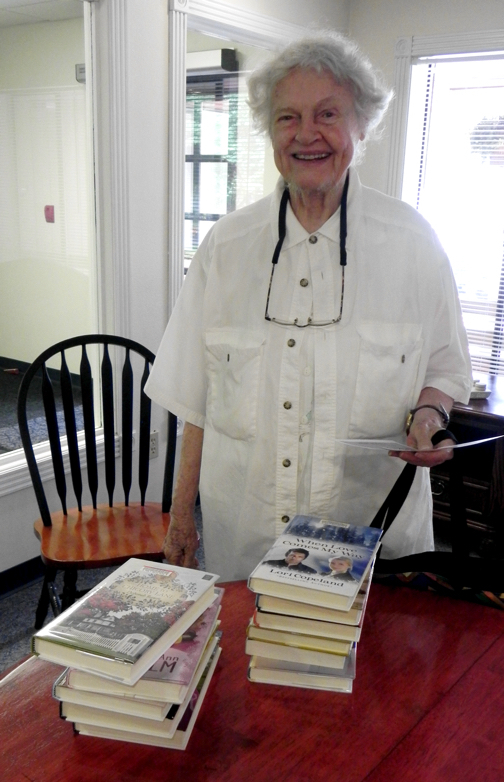 When the Library on Wheels stop was over, she was a happy customer as she smiled for the camera with her big stack of "happy books", chosen specially for her by her caring librarians. Library customer with her "happy books"
You can find earlier stories in this series here: Part 1, Part 2, and Part 3. 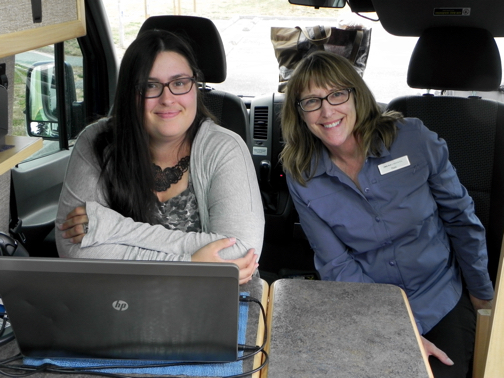 And I'm including a video I think you'll enjoy about the Library on Wheels. 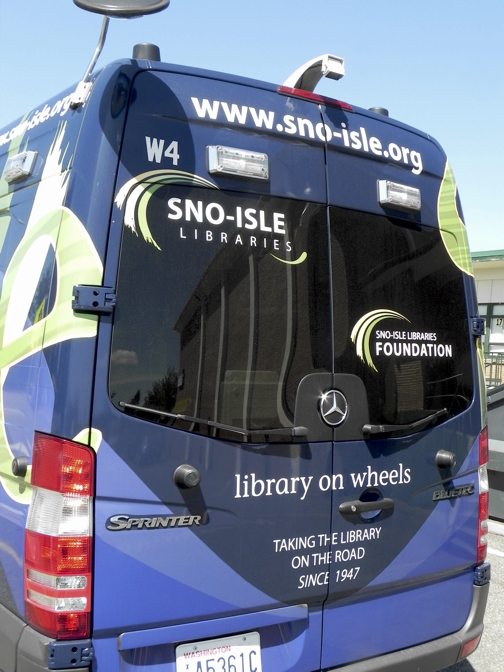 I also encourage you to look at the Sno-Isle webpage to get more information about the Outreach program of the library, especially if you might have someone in your life who is homebound or would otherwise benefit from the outstanding service available through the library. 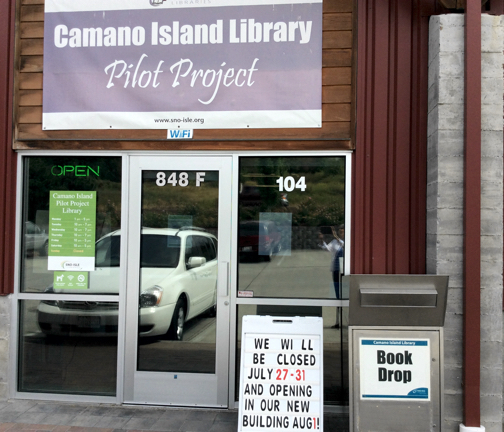 The residents of Camano Island had a dream: they wanted a library of their own. 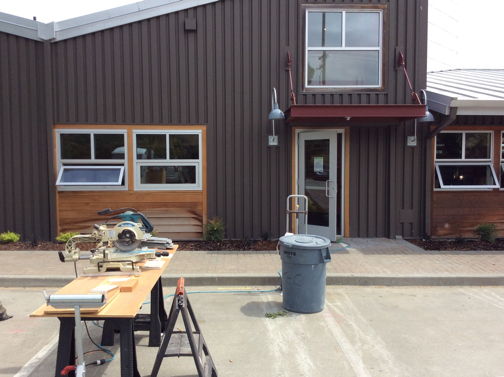 They could, of course, continue using the Stanwood Library, but what they longed for was something in their own neighborhood. In 2007 they opened a little library in an empty storefront at Terry's Corner, an 1,800 square foot space with 6,000 items available to check out. They called it a pilot project, a chance to test the waters. Could they entice enough islanders to join them in their vision? It took seven years (much longer than they had expected) and two attempts at a levy vote to see their dreams fulfilled. 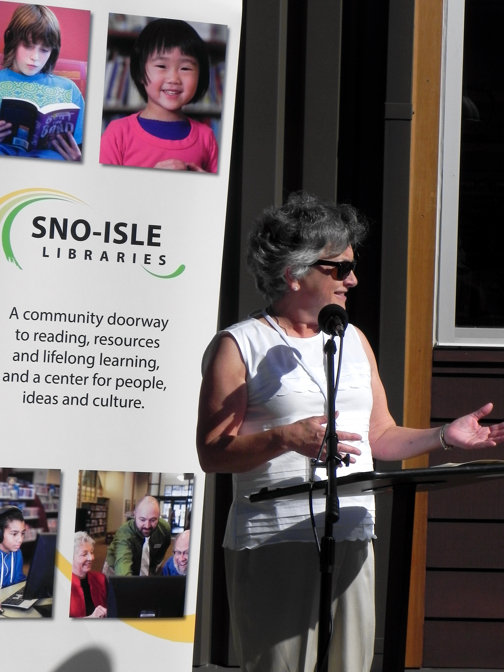 The project required the involvement of local government, Sno-Isle board members, Camano Island Friends of the Library, and the community at large. Their combined efforts resulted in the necessary funding, planning and renovating of a vacant restaurant a few doors from the pilot library; the selection of items for the library's collection (now more than 18,000 books, movies and other media); and the myriad other details required for such a mammoth undertaking. 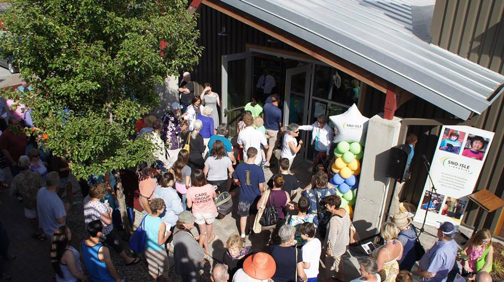 On August 1, 2015, at the Grand Opening of Sno-Isle's Camano Island Library, an estimated crowd of 200 gathered to hear speeches and watch the ribbon cutting as they celebrated the passion and hard work of the many people who made this dream a reality. Excitement ran high. And when the doors opened and the people streamed in, they were not disappointed. Everything in the library was brand new, even the books! As I was looking around a friend called out my name and held up a cookbook. "Look," she said, "I'm the first one to ever check out this book!" Two days later she told me that she'd already tried out a recipe from its pages. 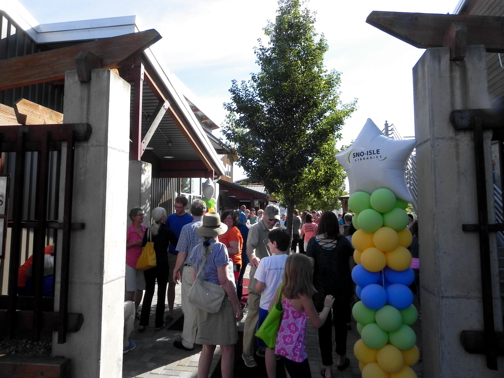 What impressed me the most about the new Camano Island library was the light. 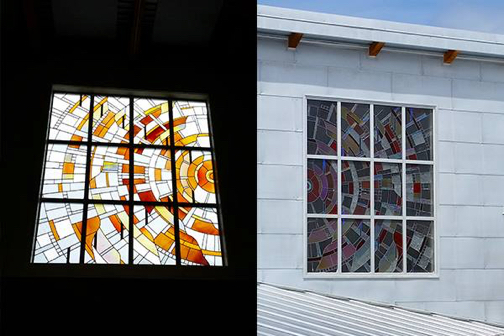 It streamed through the huge windows, filtered through the stained glass window that was in the original design of the building, and was enhanced by the muted colors and green design of the space. You'll find several designated rooms or areas throughout the new library, places for kids (both children and teens have their own spot), an inviting reading room—complete with a fireplace—to sit and read, and a community room, where groups can meet to discuss books, plan projects, and hold community meetings and events. 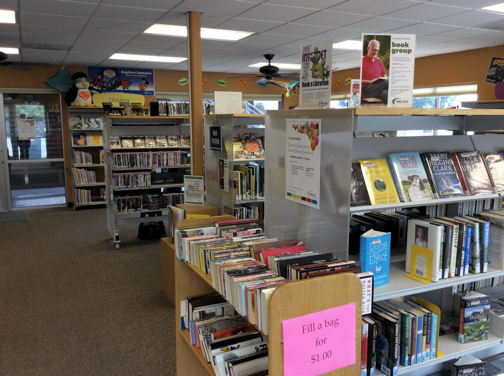 Friends of the Library, an integral part of making the Camano Island Library a reality, also has a prominent location for displaying their books on sale. 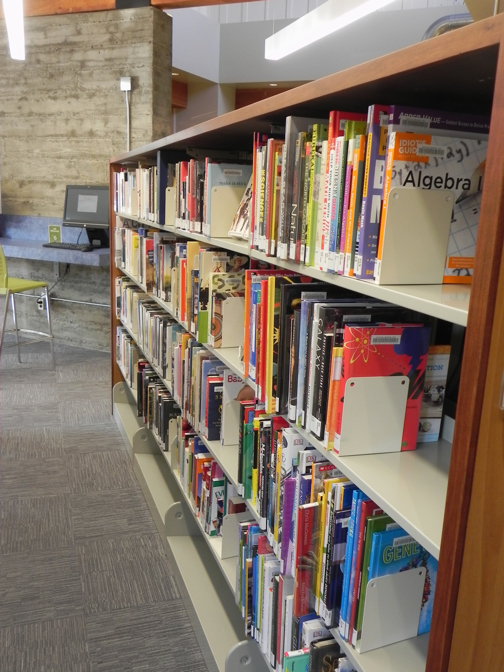 Sno-Isle Libraries feature more than books, music, and other media. 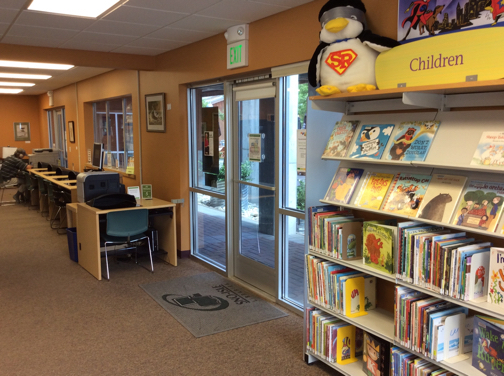 Enter any of the twenty-one Sno-Isle libraries and you will find art by Northwest artists. 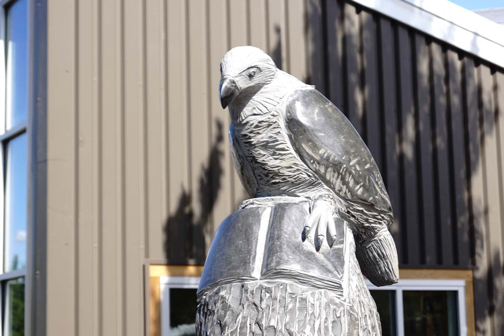 Camano Island Library's first piece of public art, a two-piece basalt sculpture of an eagle perched on a pillar, alight a book, with a cared out basin bowl standing beside it, was the creation of Josh Henrie. The basin, which is intended to collect water, represents the ocean and the tide pools surrounding the island. 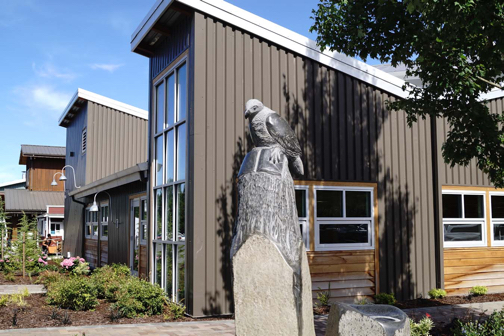 And what could be a more fitting motif for Camano Island and its residents than an eagle, the water, and a good book? If you missed Part 1 of this series, They Don't Have the Book I Want!, and Part 2, Getting My Book to Me, be sure to check them out. 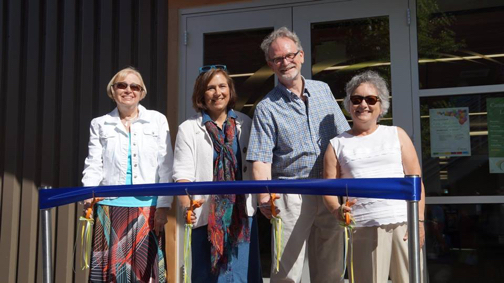 And you can join in the Camano Island Library Grand Opening, even if you didn't attend, by watching this celebration video.